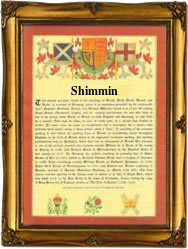 This unusual and intriguing surname recorded in the spellings of Shemmans, Shemming, Shimman, Shimmans, Shimmin, Shimmings, and Simmings, can be either Olde English or Gaelic-Manx origins. Taking the Olde English first, derived from the word 'scima', it is an example of that interesting group of early surnames that were gradually created from the habitual use of bynames or nicknames. These were originally given with reference to a variety of personal features, such as physical attributes or peculiarities, and mental and moral characteristics. In this case the meaning is "the fair one", and referred to someone with bright, shining hair, and this may have been a reference to an Anglo-Saxon, and therefore not necessarily complimentary! The Manx-Gaelic are more complex. They probably derive from the Norse 'Sigmundr', a popular personal name, but their is another claim of the Norman-French 'Simon', recorded in Ireland as Mc Simeen, and probably introduced into Ireland by the Anglo-Norman Invaders of the year 1170. Early examples of the name recordings include Roger Scymming is in the Cambridgeshire Hundred Rolls of 1279, and Richard Shymmyng in the Minister's Accounts of the Earldom of Cornwall in 1297. The church register recordings include the christening of Alice, daughter of Thomas Shemans, at Ratcliffe Culey, Leicestershire, on April 13th 1606, Robert Simman, Ammy Shimming and Ann Shimmans in the Suffolk parish registers of 1775, and the christening of Joseph, son of William and Hannah Shemmans on July 9th 1833, at Ansley, Warwickshire. The first recorded spelling of the family name is shown to be that of John Schemmeng, which was dated 1279, in the "Hundred Rolls of Cambridgeshire", during the reign of King Edward 1, known as "The Hammer of the Scots", 1272 - 1307. Surnames became necessary when governments introduced personal taxation. In England this was known as Poll Tax. Throughout the centuries, surnames in every country have continued to "develop" often leading to astonishing variants of the original spelling.